I'll bet you dollars to donuts that you'll like the new three reel slot from Rival Gaming that just arrived at Slots Capital and Desert Nights Casinos! 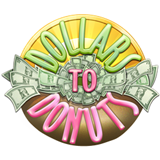 Dollars to Donuts is a classic 3-reel, five pay line slot game. It has traditional bars and sevens spinning on its reels -- and a lucky Pink Donut icon. Two Pink Donuts pay 3000X the bet and three pay 5000X. The mouth-watering Dollars to Donuts is available in the online casino and in the mobile casino for smartphones and tablets. Until the end of the month you can claim an introductory deposit bonus up to $500 and a $100 Free Bonus. No max cash-out, wagering requirement 30X. Players that redeem this bonus are automatically eligible for an additional $100 free bonus. 50X wagering requirement; max. cash-out $500. These bonuses are available until March 10, 2017 only. Slots Capital Casino and Desert Nights Casino, which welcome players from all over the world, both offer a wide selection of casino games from Rival Gaming.